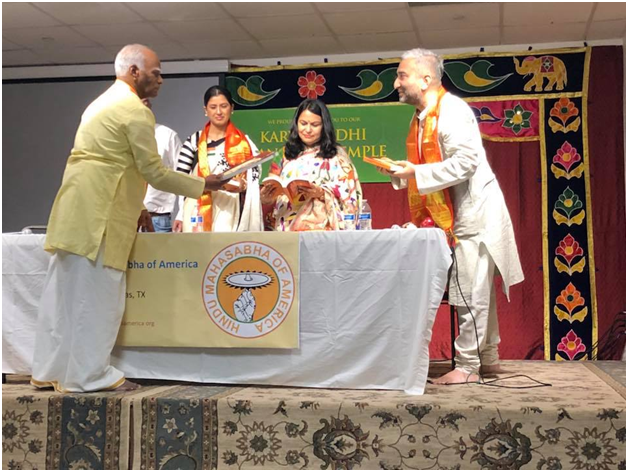 Recently Hindu Mahasabha of America organized timely program to assess the conditions that are detrimental to the survival of Hinduism in India since Independence. 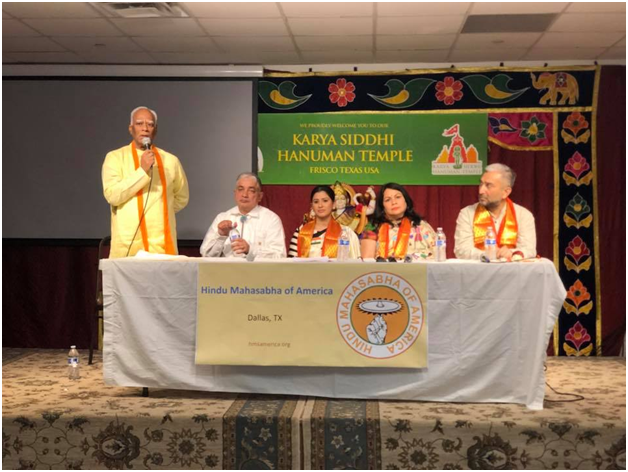 Dr. Rudranath Talukdar, Shourie Bannai, Brijender Tanwar and others organized the program at Karya Siddhi Hanuman Temple in Frisco TX. Dr. Prakasarao Velagapudi, Chairman of Datta Yoga Center and President of Global Hindi Heritage Foundation was invited as Guest of Honor. 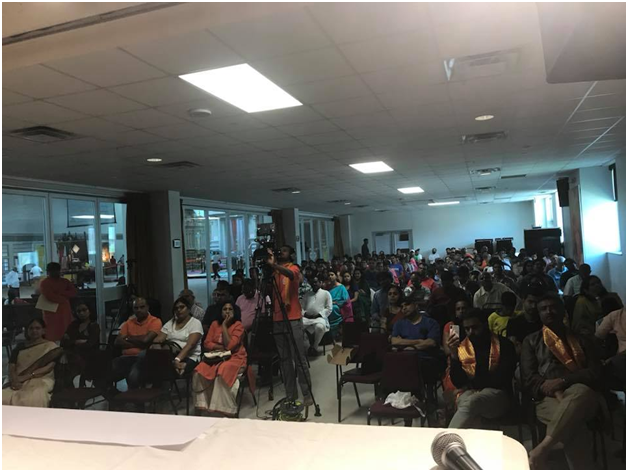 This meeting was attended by nearly 200 enthusiastic Hindus. Dr. Prakasarao spoke about the need for protecting Hinduism for the sake of humanity. 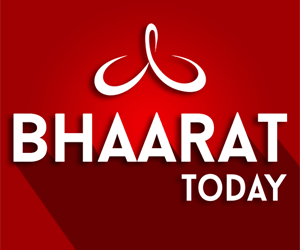 If Hindu roots are pulled out of Bharath, the whole humanity will be in peril. Hinduism in at cross roads. We can even say that Hinduism is on the death bed. State by state we are losing privileges to the Christians, Muslims, secularists, and intellectuals. West Bengal, Kashmir, Assam, Kerala and Hyderabad are stifling and suffocating Hindus and pushing them to the wall. Many Hindus are drive out of their states with no course. Andhra Pradesh and Telangana are joining the other states depriving the freedom of speech and freedom of gathering. In July Swami Paripoornananda Was house arrested and externed from Hyderabad for making statements supposedly may have hurt the feeling of the minority religions. Then he mentioned that Andhra Pradesh government arrested and put 15 Swamijis in jail for organizing pada yatra from Vijayawada to Tirupathi in protest over the employment of Non-Hindus in TTD. 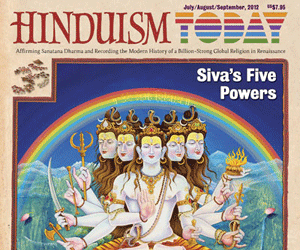 Then he went on narrating the circumstances that lead to the formation of Global Hindu Heritage Foundation in 2006. State government have taken Hindu Temples under their control depleting the resources of Hindu Temples by diverting to Christians and Muslims. All four Southern States have passed Endowment Acts there by taking control of any temple that is making 50,000 rupees or more per year. In the North, only richest Temples are taken over by the state government. For example, Siddhi Vinayaka Temple, Shirdi Saibaba Temple, Puri Jagannad Temple, Kasi Viswanath Temple, Amarnath Temple, and so on. State governments do not account for lands, donations, jewelry, and expenditures. The do not even submit audit report to find out how the government is spending the money. Every Hindu and especially every Hindu NRI should take the responsibility of preserving and protecting Hinduism and Hindu Temples. All of us must ask ourselves as to what am doing to preserve my religion. Every day we may have to ask ourselves to see how we can support and participate in preserving our Hinduism. We, the NRIs, can make the difference. Please watch this Ten-minute video assess the danger Hinduism is facing.